DREAMSCAPES WINTER/SPRING 2017 44 T he weather is gorgeous. You can live in a cottage with a rosemary hedge and a lemon tree out front, cycle past world-famous vineyards and sip fairy- tale pumpkin soup. One chef calls it a Disneyland for adults. 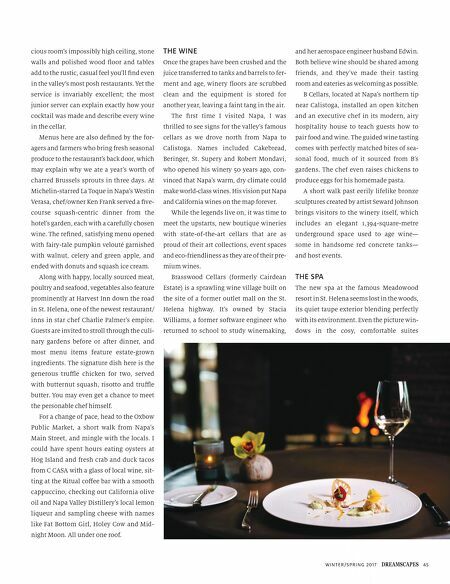 An hour's drive from San Francisco, Napa is also the perfect place for a food, wine and wellness getaway. Late fall is an ideal time to visit, and not just because rows of grape vines that criss- cross this skinny valley glow in a tapestry of golds and rusty reds. Following the mad rush to complete the harvest, the pace slows, making it easier to nab a restaurant reservation and a behind-the-scenes winery tour. Chefs offer heartier dishes to pair with the valley's prized Cabernet Sauvignon. In fact, locals call November to April Cabernet Season, and kick things off with the Napa Valley Film Festival in celebration of film, food and wine. THE FOOD Our first dinner in the 80,000-strong city of Napa set the bar high. Chef/owner Sean O'Toole of TORC may not be Italian, but he'd make any nonna proud with his hand-cut tagliatelle noodles tweaked with lemon and shards of Parmigiano-Reggiano or his house-made strozzapreti (strangled priests) warmed in a deeply delicious lamb jus shot through with soft licorice fennel, a hit of sweet, unctuous black garlic and a spritz of satsuma mandarin. O'Toole named his Main Street restaurant for the wild boar, the scourge of winemakers whose meat is beloved by chefs. The spa- BY CYNTHIA DAVID TOP: Fall vines in Yountville. Cynthia David BOTTOM: Entrance to Meadowood Spa in St. Helena. Cynthia David OPPOSITE: A tasty treat at La Toque. 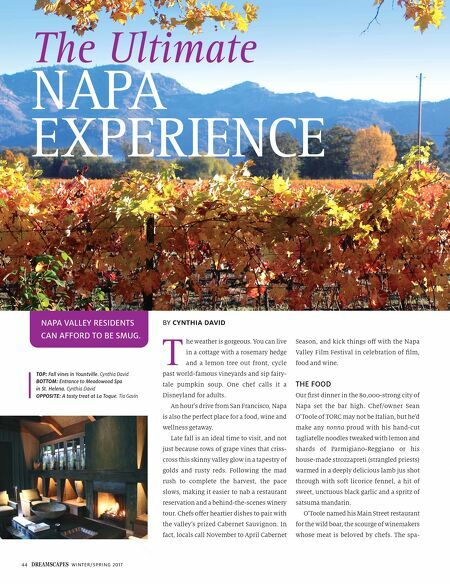 Tia Gavin The Ultimate NAPA EXPERIENCE NAPA VALLEY RESIDENTS CAN AFFORD TO BE SMUG.